Some time back, I had an interesting career query from a young, bright student of class XII who opted for Physics, Chemistry, Biology (PCB), as he came from a family of doctor's, and surprisingly didn't want to be doctor. He was not aware of any upcoming or new age careers in PCB other than Medical. While exploring other options for a career he came across "Medical Coding" which sounded appealing to him. He had heard about it once, but he had a very limited knowledge about this field. So many questions popped up into his mind, like what is Medical Coding? Is it same as Medical Billing? Are there courses available in this area? What qualifications are required to be a Medical Coder? So I decided to write this article which throws light on this promising field. Nowadays there is an extraordinary rise in the career opportunities available in the different fields. A lot of new opportunities are arising in the Indian job market. Medical coding is an upcoming in-demand field in the stream of Healthcare Administration. Among the various upcoming career opportunities; Medical Coding is also a very good career option for the youth of our country. With the growth of the various sectors, healthcare sector is also witnessing a sudden growth in our country. This sector is generating millions of jobs not only in India and United States but also in other developed and developing countries. CAREER OVERVIEW- What is Medical Coding all about? In simple terms, Medical coding is the translation of medical reports into a short code used within the healthcare industry. This helps summarize otherwise cumbersome medical reports into efficient, data-friendly codes. These code sets help coders document the condition of a patient and describe the medical procedure performed on that patient in response to their condition.It is an important process in medical billing and plays a vital role in overall reimbursement cycle. WHY IS MEDICAL CODING IMPORTANT? Medical billing and coding employees are essential and crucial for success of healthcare facilities and providers. They rely on the expertise of medical coding and billing individuals to assist in billing of services provided to their patients and processing of claims. The diagnoses and procedure codes are taken from medical record documentation, such as transcription of physician's notes, laboratory and radiologic results, etc. 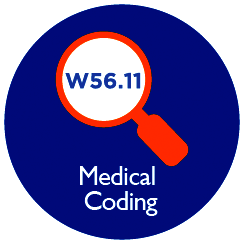 Medical coding professionals help ensure the codes are applied correctly during the medical billing process, which includes abstracting the information from documentation, assigning the appropriate codes, and creating a claim to be paid by insurance carriers. The answer is No. Medical coding and medical billing are two separate processes. The main task of a medical coder is to review clinical statements and assign standard codes. Medical billers, on the other hand, process and follow up on claims sent to health insurance companies for reimbursement of services rendered by a healthcare provider. The medical coder and medical biller may be the same person or may work with each other to ensure invoices are paid properly. To help promote a smooth coding and billing process, the coder checks the patient's medical record (i.e., the transcription of the doctor's notes, ordered laboratory tests, requested imaging studies, and other sources) to verify the work that was done. Both works together to avoid insurance payment denials. Medical coders play a vital role in the connection between health care providers, patients and insurance companies. As a coder, you'll need to read patient charts to determine medical history, including diagnoses and treatments given. Based on these charts, you'll use a set of established medical codes in order to transcribe patient history into a type of "shorthand" that will be used by both health care providers and insurance companies. The medical coding profession is also popular for those looking for self-employment. In this capacity, you may be consulting on-site at medical facilities or working remotely. Medical coders typically work remotely and partner with a health care facility that sends the information needed to code patient records and bill insurance companies. SKILLS REQUIRED - However, medical coding is a competitive field, and to succeed, one must possess a number of critical skills. Everyone considering career in medical coding courses should possess, the following skills and abilities. In a medical coding position, you will be constantly handling sensitive patient information, and you have the responsibility for making sure that these details remain confidential. If you share the information with anyone, even a co-worker, you may be subject to a lawsuit. For this reason, it is necessary to be discreet, including when requesting support from medical staff or other coders. You may have to handle a large number of cases at the same time. Organizational skills will enable you to work efficiently, stay on track with tight deadlines, and send records to the correct places. This is particularly important for freelancers working at several medical centers. To convert information into the correct codes, you need to learn medical terminology. This means possessing a basic idea of human anatomy, physiology, and common diseases. You will also need to understand the concept and purpose of simple procedures. A degree in life science gives one a upperhand. HOW TO BECOME A MEDICAL CODER? WHAT YOU NEED TO DO TO PURSUE A CAREER IN THIS FIELD? Medical coding as a profession requires a lot of accuracy which comes with practice. A sound knowledge of the human anatomy and biology is very essential for performing the task of medical coding. Now, here comes a very important question: who can do medical coding or is there any eligibility criteria for the profession of Medical coding? In most of the cases bachelor's degree in the life science stream is a must. For example: A bachelor's degree in Biotechnology, Microbiology, Botany, Zoology, Physiotherapy, B.Pharma etc. Students with backgrounds other than science can also pursue a career in medical coding by taking courses and training from recognized institute or academics. As this profession involves organizing and maintaining medical information converting them into predefined codes, this job is well-designed as women are believed to be good at managing and organising things. Those who have passed the certification courses in medical coding are eligible to apply to the post. Certification after graduation is much desirable for the said post. Adequate exposure in the area is also an essential eligibility to become a medical coder. Pursue graduation from a recognized educational institution. Obtain relevant experience in the area. In India, most of the firms prefer graduation as the necessary qualification for the post of Medical Coder. Certificate courses in medical coding will help one to get an entry in to the job. Along with this, candidate should possess proven experience in the area of medical coding. Bachelor degree in Medical Information Technology is the qualification required by international firms for the same post. Anyway, graduates with adequate skill and experience will also be considered for the same. It's also advisable to go for regular training than on-line training for professional trainings like medical coding. Healthcare industry is a fast growing industry; so as the career opportunities in the industry. The demand for Medical Coders is increasing all over the world day by day. With the growth of private insurance sector in India, sooner or later the healthcare industry of our country might also be based on the insurance and we might also need to do medical coding in different areas of healthcare. The physician offices, the hospitals and the insurance companies may demand more and more Medical Coders in future also. Presently the need for coders is high in outsourcing companies in India. India is a developing country and has been trying to focus on improving the healthcare segment and raise it to international standards. The fact is that there are numerous hospitals and medical facilities found across the country that has been providing top class services at affordable rates. Another aspect is that not only domestic patients, but also those from the surrounding regions and other continents have been coming down to the country for availing better treatments and facilities that would be required by them. This is why; the scope of candidates to pursue a career in the medical industry has been growing immensely of which one is medical coding. There are two factors that again make the demand for Coders high. Due to the immediate implementation of ICD-10 (International Classification of Diseases-10th Revision) and EHR (Electronic Health Record), the Healthcare Industry is aggressively looking for trained, efficient, knowledge-able and certified coders. So there is a tremendous chance of career growth in the Medical coding streams. Many healthcare companies are operating in India and abroad which are providing healthcare services. Every year, they hire thousands of trained coders from the medical, pharma and other life sciences backgrounds for the Medical coding functions. In terms of compensation medical coding industries are very good. Companies are providing a very handsome package and proper growth in this industry. Good communication skills backed by a certification in coding will help students be part of one the leading industries. (The author is a Senior Counseling Psychologist.